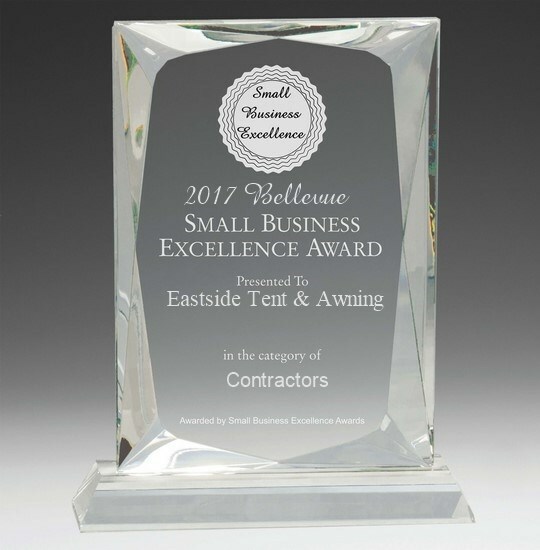 We’re thrilled to announce that Eastside Tent & Awning has been selected for the strong>2017 Bellevue Small Business Excellence Award in the Contractors classification by the Bellevue Small Business Excellence Award Program. Various sources of information were gathered and analyzed to choose the winners in each category. The 2017 Bellevue Small Business Excellence Award Program focuses on quality, not quantity. Winners are determined based on the information gathered both internally by the Bellevue Small Business Excellence Award Program and data provided by third parties. The Bellevue Small Business Excellence Awards recognizes outstanding small businesses that serve the Bellevue area. Each year, our selection committee identifies businesses that we believe have achieved outstanding marketing success in their local community and business classification. Recognition is given to those companies that have shown the ability to use their best practices and implemented programs to generate competitive advantages and long-term value. These are small businesses that enhance the positive image of small business through service to their customers and our community. These exceptional companies help make the Bellevue area a vibrant and vital place to live. The Bellevue Small Business Excellence Awards was established to reward the best of small businesses in Bellevue. Our organization works exclusively with local business owners, trade groups, professional associations and other business advertising and marketing groups. Our mission is to award the small business community’s contributions to the U.S. economy. 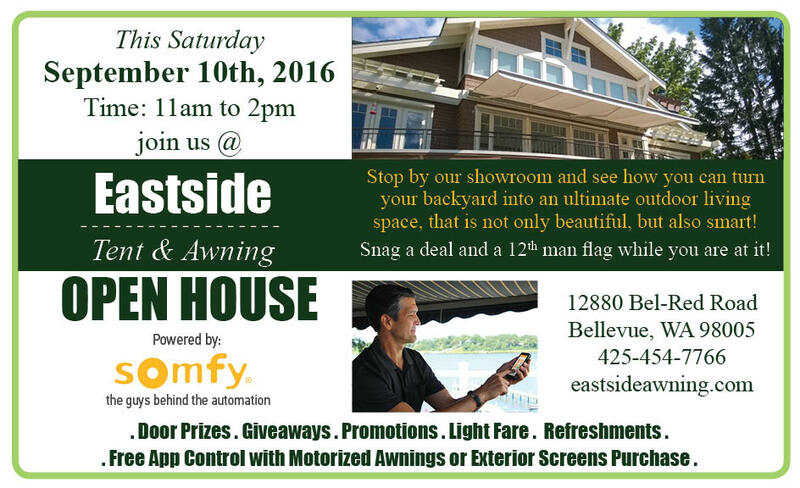 We invite you to join us this coming Saturday, September 10, 2016 for an Eastside Tent & Awning Open House. Stop by our showroom and see how you can turn your backyard into an ultimate outdoor living space, that is not only beautiful, but also smart! As we move further into the 21st century, homeowners are looking for new ways to save money and help the environment. 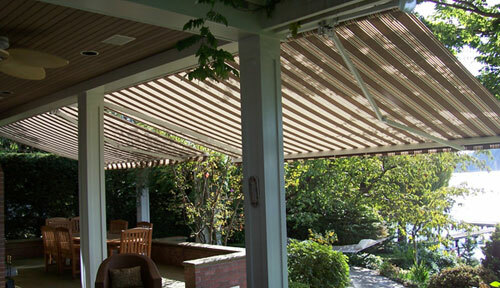 Many households have discovered a great and affordable way to save big on energy costs over the coming years: retractable awnings. The family at this lovely home in Bellevue, WA wanted a patio covering they could easily expand or retract depending on the volume of sunlight or rain. We installed this lateral arm awning on the home, which greatly enhances the look of their patio while increasing its usability. Check out the work we did on this home in Clyde Hill. 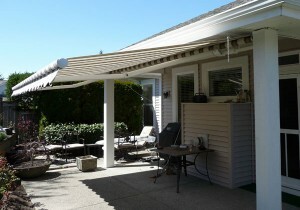 We do residential awnings like this all the time. 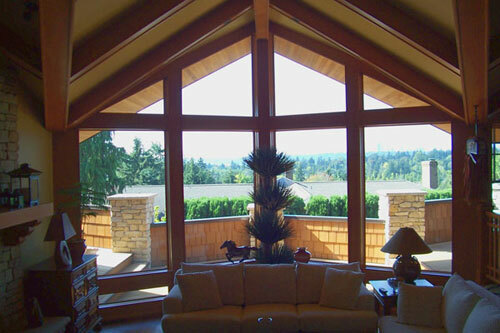 In this Clyde Hill example, plenty of sunlight is still allowed into the home, but not too much. Eastside Tent & Awning installed this Tucson solar screen on a house in Redmond, WA, and have installed similar solar screens in other nearby cities. Check out this Tucson solar screen in action – it’s a great way to save energy costs in both the summer and winter.